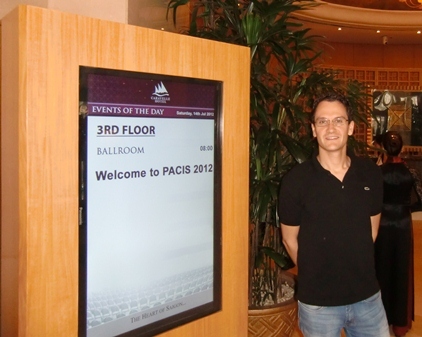 Auf der internationalen Konferenz Pacific Asia Conference on Information Systems (PACIS) 2012 wurde am 16. Juni 2012 der Projektbeitrag "Resolving Trade-offs in Service Performance Benchmarking Using Data Envelopment Analysis" durch den Projektmitarbeiter Hans Peter Rauer vorgestellt. Mit dem Beitrag konnte das Ziel verfolgt werden. die Erkenntnisse des Projekts ServDEA in einem internationalen Rahmen vorzustellen. The purpose of this paper is to make an argument for utilizing the Data Envelopment Analysis (DEA) as a method to resolve conflicting goals in service performance management systems. Service businesses are faced with two particular challenges that introduce the need to trade-off metrics against each other. First, their rather intangible and perishable properties require incorporating non- financial performance indicators such as perceived quality or resource utilization into the calculus. Second, the nature of service systems as open systems makes performance calculations subject to different perspectives on value creation. Traditional approaches to resolve these conflicts are mostly based on weighting the metrics a priori based translating management strategies into action, which might lead to biased performance calculations. With a comparative example, we demonstrate to what extend the DEA is able to resolve these trade-offs without specifying a priori weights which offers the chance to compare unbiased data with current strategic objectives.